Posted by santos. This entry was posted on 20051022 at 3:18 PM You can skip to the end and leave a response. ummmMMMMMMMM. i don't know which one i want to try first! but i'll definitely be making the chocolate gelato in my icecream machine. i just made kiwi sorbet the other night -- tangy and refreshing. Those are beautiful! Long and skinny is prettier and so much more practical than something on a stick (where a big chunk inevitably falls to the ground). 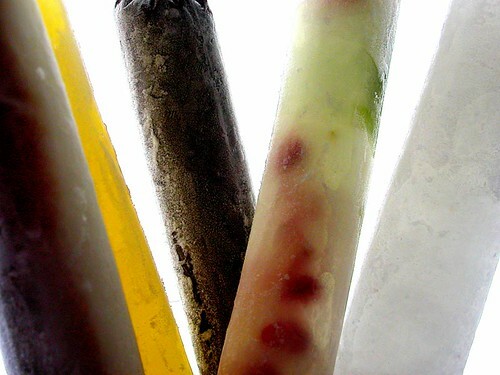 your post brought back memories, used to make assorted flavors of ice candy back in the Philippines when my mother still had her "sari-sari" or variety store in Marikina - we sold them fast in the hot summer months - still remember those pastel colored plastic tubes of ice candy, our buyers prefer them creamy with milk in mango, orange, pineapple, strawberry, cantaloupe & other refreshing flavors...thanks for the memories!! How cool are they!!! Me want some too.... I too like popsicles more than the creamy stuff. Gosh, those look really really good... and the flavors/colors...spectacular! I wish I could find this style of plastic bags here. I would get a lot of use out of them, I'm sure! hallo bowb--my current favourite is the milky bean one, but the fruity ones are not far behind. hi mumu! i think it's a worldwide thing, to be economical about leftovers :) but i'm glad i could dredge up an old memory for you. hi cathy--i do like this shape, much less messy and takes up very little space in the freezer. and look at all the cool things you can add! hi marketman--someone should think about selling different sorts of ice candy at one of the markets some time, just to see how they'd go over. i remember that there was some ice dessert fad for awhile, why can't there be an ice candy one? hi nic--try looking at one of the asian or indian grocery stores some time, they might be available. if you have a vacuum sealing machine, you can easily make some. 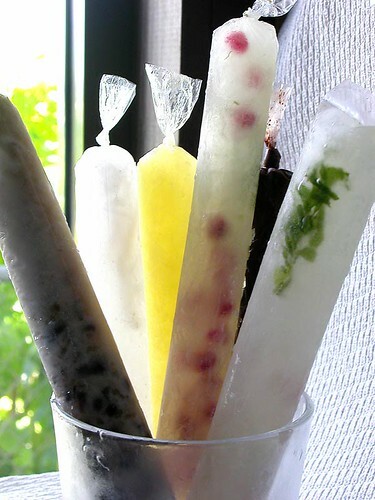 you can also make super skinny ones by closing off one end of those tapioca drink straws (also available at asian supermarkets) and then just push up the ice as you go along. you and me both, santos. 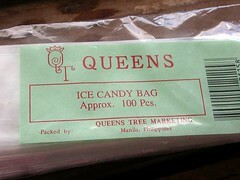 i still have bags of this from my last visit -- and ask relatives to bring some when they come! your varieties are awesome though, so different from my lola's pinipig! Fantastic idea. Reminds me of the giant raspberry and cola Supa Dupas we used to have as a kid. Oh my. Gourmet ice candies. You gave me some great ice candy flavor ideas. hi agustus! oh, i wish there were more raspberries right now, i'll bet you could make a spectacular ice pop with some. hi sky! i hope you'll post some of your creations some time. hi meg--i'll bet you could find them in an asian grocery. hi amber! what flavours can you find in malaysia? hello iska--certainly, i recommend it--you never know what you'll want to freeze in a tube :) i added you to the list, i hope you don't mind. Corn, durian, red bean, asam boi (preserved plum), you name it... depending on the maker's creativity. This is a great LP3 entry, Santos! Gourmet ideas for ice candy flavors! Thanks for participating in Lasang Pinoy 3! hi! i'm bunty from india. i'm planning to manufacture the ice-candies of different flavours in central india. can any one please help me to know more about ice-candies and the different flavours? hey, i just saw ur blog and it really brought back memories to me too when i was still in the philippines and i was just wondering if is there any store in the US where we can get the ice candy bag?? maribeth, i don't know of any stores, but if i find one, i'll leave a comment! Those ice candy plastic bags are so useful in the kitchen. I stocked up on it when I lived in the states. I put leftover condiments (because sometimes the ratio of calamansi and patis in that batch of sawsawan is just TOO good), pasta sauce for freezing, crayons... whatever that needs a small bag. That said, your post is so inspiring! Thanks for sharing. whoa. i just took a look at pinterest for the first time--i can't believe how popular that post is! i gotta figure out how to use pinterest. thank you for the heads up! OMG... I grew up making these with my family! I'm from Machanao btw and it's so nice to see your tumblr with Guam pictures! I miss my hometown! i see you live in Guam..we are moving there in December..
define1lady come back and visit! Found this link on pinterest. I would LOVE to try these come summer. I cannot find an online source for the bags. Can anyone help me out in locating them? I recently found the bags to make ice candy sold on e bay. I bought a pack and they were a little longer than I remember them in the Philippines but I just didn't fill them all the way full. Fun treat! Is it possible to buy these bags online since a trip to the philippines is not in my future! If so can you please send me the link? Thank you so much! I love these kinds of unique recipe ideas! I found the ice bags on Amazon. I can't wait to try these out... just went to the Asian store to buy annko Mmmm Thank you so much for the great idea!!! These are much better and healthier than those ice pops they sell at the store! This was one of my favourite treats the year I lived in the Philippines. We called it a-go-go. My fave flavours were the buko and the avocado - actually that one was my absolute favourite!! My mom brought some of the wrappers back for me, but I've been hesitant to use them (all 10+ years I've had them...) because of all that stuff about BPA...maybe someday when my kids are older, I'll get over that fear, lol.